This is a book about an age of filmmaking that most people don't even know existed. It's a book about a group of entrepreneurs that, almost by accident, pulled movies out of the realm of novelty and into the realm of business—and ultimately into the realm of art. was perfect for the country's (and the world's) growing infatuation with the West, turning the land itself into a bigger star of the early cinema than any particular actor. So join us as we recount the stories of the founders of the American film industry and see how the west shaped the emerging motion picture business—a tale told with all the relish and enthusiasm of a western saga. 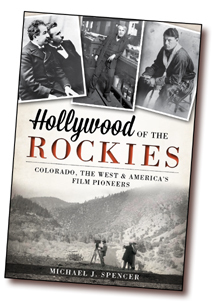 Writer and filmmaker Michael J. Spencer explores the little-known filmmaking industry that flourished in the Rocky Mountains between 1895 and 1915 – west of New York but east of Hollywood.